While on a business trip to Kobe, Tsuneo Asai receives the news that his wife Eiko has died of a heart attack. Eiko had a heart condition so the news of her death wasn't totally unexpected. But the circumstances of her demise left Tsuneo, a softly-spoken government bureaucrat, perplexed. How did it come about that his wife--who was shy and withdrawn, and only left their house twice a week to go to haiku meetings--ended up dead in a small shop in a shady Tokyo neighborhood? Seicho Matsumoto was Japan's most successful thriller writer. His first detective novel, Points and Lines, sold over a million copies in Japan. Vessel of Sand, published in English as Inspector Imanishi Investigates in 1989, sold over four million copies and became a movie box-office hit. Seicho Matsumoto: Seicho Matsumoto (1909-1992) did not see his first book published until he was in his forties. He was a prolific author, producing in four decades more than 450 works. He is considered Japan's most accomplished writer of mystery and detective fiction. Matsumoto's first full-length detective fiction, Ten to sen ('Points and Lines'), after running as a newspaper serial from 1957 to 1958, was a big hit as a book in 1958, selling over a million and a quarter copies. In 1961, Suna do utsuwa ('Vessel of Sand', 1961, published in English as Inspector Imanishi Investigates, 1989) sold four and a half million copies and became a movie box-office hit. 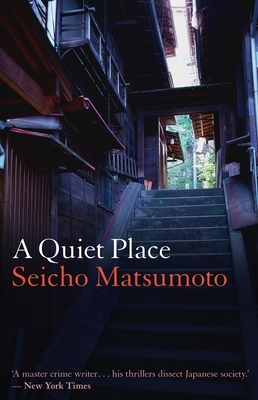 'A Quiet Place' was originally published in Japan in 1971 as Kikanakatta basho. This is the first time it has been translated into English. It was written about half way through Matsumoto's writing life. Louise Heal Kawai: Louise Heal Kawai comes from Manchester. She has spent the past twenty years in Nagoya, Japan, as a translator and teacher. Her published translations include Daido Tamaki's Milk, Tendo Shoko's best-selling autobiography Yakuza Moon; and most recently Building Waves, a novel by Tomioka Taeko.